This movie is on the recommended viewing list for the game Fiasco so I have been wanting to see it; once I noticed that it has been sitting on Netflix Instant Watch and was subtitled it quickly went on my queue. Although it is not without its flaws this movie is slowly growing on me and is becoming a favorite. The opening scene where the two buddies get into a brawl outside of a bar sets the tone for the movie and lets you know this is not a typical Hollywood action movie with the hero taking on dozens of opponents in short order and running unscathed through a hail of bullets. This film has realistic violence with it ugly and brutal results and the main characters wind up bloody and beaten in the middle of a street. Plot summary: Two petty if violent criminals kidnap a girl being paid $1m to be a surrogate mother. As the baby is for a gangster the pair’s demand for money sees several henchmen and assorted other ruthless characters head after them to Mexico. Bullets rather than talking are always going to settle this one. What follows is an extremely complex tale that is most definitely not your standard Hollywood movie with tragedy and betrayal at its heart. In terms of a Fiasco style of movie, if you watch how every character has some sort of relationship an is connected and the way these all unfold at the end you see exactly the sort of style that a Fiasco game is building as it develops. 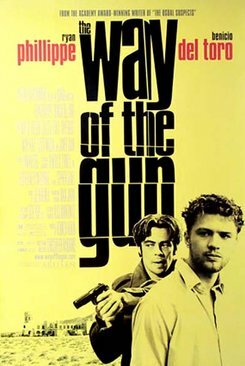 Way of the Gun is certainly not without its flaws, extremely slow pacing especially at the beginning and the way it is not the two main characters who are the heroes of the story. If you keep in mind that the amoral pitiless two that open the story are not the protagonists then the movie makes far more sense. I wish there were more movies like this coming from Hollywood instead of the cookie cutter made-by-committee movies that are churned out by the dozens.